Trucking company owner Roy Weedman of Bud Construction testified to his operations with Salt & Pepper Construction at a Portland City Council hearing in June. 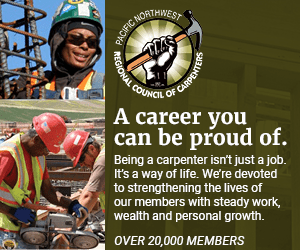 The National Association of Minority Contractors of Oregon included the video of his testimony in a complaint to the Federal Highway Administration, which has found that the company was wrongfully earning contracts as a Disadvantaged Business Enterprise. The Oregon Department of Transportation has been stung by a landmark ruling by the Federal Highway Administration Office of Civil Rights that found cheating on minority contracting numbers at a Highway 217 construction project. The three-part ruling, dated Aug. 29, says that Salt & Pepper Construction Company, Inc., is not really a Disadvantaged Business Enterprise despite the fact that it was certified as one by the state Office of Minority, Women and Emerging Small Business; that Salt & Pepper colluded with the project's prime contractor, Emery & Sons, and a non-DBE company called Bud Construction LLC to fake minority participation in the highway project; and that ODOT "failed to exercise effective DBE program oversight" in allowing the companies to profit from federal dollars intended for disadvantaged businesses. The FHA is demanding that ODOT "evaluate the implementation of its DBE program and submit a plan of corrective action" by Oct. 31 of this year; also ODOT must "adjust DBE accounting" to reflect Salt & Pepper's "performance as a DBE on the project and in the overall program;" ODOT must "require" the OMWESB office to remove Salt & Pepper from its rolls of certified DBE companies; and finally, ODOT must submit its "findings" to further review by the FHA. "It's a milestone," said NAMC-O Executive Director Melvin Oden-Orr. "The milestone we hope it is, is one that says to ODOT that compliance is important or fraud will run rampant." ODOT spokesman Patrick Cooney, pictured at left, said Thursday that the bureau plans to follow through with the FHA's findings and intends to take steps to correct the problem. "This is not how this program's supposed to go," Cooney said. "We are in the process of examining step-by-step what happened and why it happened." He said he couldn't speak to specifics because ODOT itself does not yet have all the information gathered by the federal administrators. "But we have until the end of October," Cooney said. A spokesman for the FHA declined to name any penalties that might be levied against ODOT because, he said, every case is different, and, "We have no reason to believe that ODOT does not plan to follow through" with the findings, he said. However he did say that, in general, any agency that fails to follow through with FHA findings faces financial penalties. Oden-Orr, pictured below, says the penalties are enshrined in federal contracting regulations, and include loss of federal funds. NAMC-O Executive Director Melvin Oden-Orr, an attorney, drafted the complaint to the FHA. "Federal Highway should and could pull all the money they have given them – including the money spent on that project," Oden-Orr said. Over the past decade consistent criticisms of ODOT's DBE operations led to a Disparity Study published in 2007, which found that specifically Black and Asian-American-owned firms were "substantially underutilized." work awarded to Asian Pacific American-owned businesses. specific areas," the study said. The issue of fraud in DBE certification is a bitter one for local minority contracting companies, who have fought city and state agencies for decades over what they say is the lack of real contract opportunities in public works projects because of open fraud by companies faking minority status. The Salt & Pepper Trucking Company's website includes pictures of their trucks and a parade as well -- but no photos of anyone of color. What makes the FHA finding against ODOT even more interesting is that one of the fraudulently-accredited contractors revealed himself and his illegal activities during testimony at a Portland City Council meeting. The company singled out by the FHA, Salt & Pepper Trucking, is this year celebrating its 40th year in business. According to their website, Salt & Pepper is African American owned and a member of the Oregon Association on Minority Entrepreneurs. Part of the complaint sent by NAMC-O to the FHA included video of a City Council meeting June 22, 2011, when the Council heard testimony on its Disparity Study. The first testimony was by a man named Roy Weedman, owner of Bud Construction –not a certified DBE company -- who describes how, as a white man, he has no access to contracts because he is "not Black or Asian." Weedman goes on to describe how he has essentially done a significant amount of Salt & Pepper's work, including managing and supervising the trucking subcontract, as well as leasing his own trucks to Salt & Pepper to do the work. Weedman goes on to describe how contractors "have found a loophole" to falsely inflate their minority participation percentages specifically in trucking and flagging operations. In its findings, the FHA said Salt & Pepper "did not manage and supervise the trucking operation for which it was responsible; did not provide at least one of its own trucks on the contract; and used a non-DBE to manage the entire trucking operation." But the FHA also sketches out deliberately illegal behavior involving two other companies as well. "Further, the facts support a finding that Emery & Sons, Bud Construction and Salt & Pepper contrived a relationship for the purpose of meeting the contract goal," the findings say. "As a result, ODOT inappropriately counted the value of the trucking services provided by DBE Salt & Pepper toward the DBE contract goal." Documents show Salt & Pepper has for years been counted as a DBE in contracts with ODOT, the City of Portland, METRO, and TriMet. It is the second time this week that the National Association for Minority Contracting –Oregon has seen some response for official complaints it has filed. On Tuesday, the Oregon Secretary of State's Office released an audit of the OMWESB certification process that found the small staff overburdened, with inadequate resources and poor organization that has caused a backlog of DBE requests – even as Gov. John Kitzhaber has called for more companies to apply for certification. The audit stopped well short of what NAMC-O called for in its request for the investigation, focusing not on DBE compliance issues, but rather on how certifications are handed out. In one section of the audit, called "Process Needed to Ensure Completeness and Accuracy," what appears to be a significant oversight appears. "For example, we found that one business certified as an ESB was later found ineligible," the audit says. However, the certification was kept open for several years prior to final closure without any explanation in the application file." Salt & Pepper Trucking was one of 14 companies specifically named as potentially defrauding the certification process. Secretary of State Kate Brown told The Skanner News on Tuesday that, despite NAMC-O's concerns about fraud in the system, the state OMWESB is doing a good job. "They went and did some double-checking of work of the certification process, and it was their findings that the office of OMWESB did do appropriate double check or verification processes," she said. "This office is not just rubber-stamping. They are verifying the applications' eligibility." While Brown said the audit's recommendations for ways to tighten up their operations are only voluntary, she described a three-point plan her office has put in place to encourage compliance, including: follow-up audits; meetings with bureau and agency heads; and meetings with the Joint Committee on Legislative Audits and Information Management & Technology. "I have no hammer – the only hammer I have is my bully pulpit," she said. "We really think that these three things with the joint legislative audits committee, meeting with agency directors or division heads, and the follow-up audits, that we are seeing greater compliance in terms of recommendations."